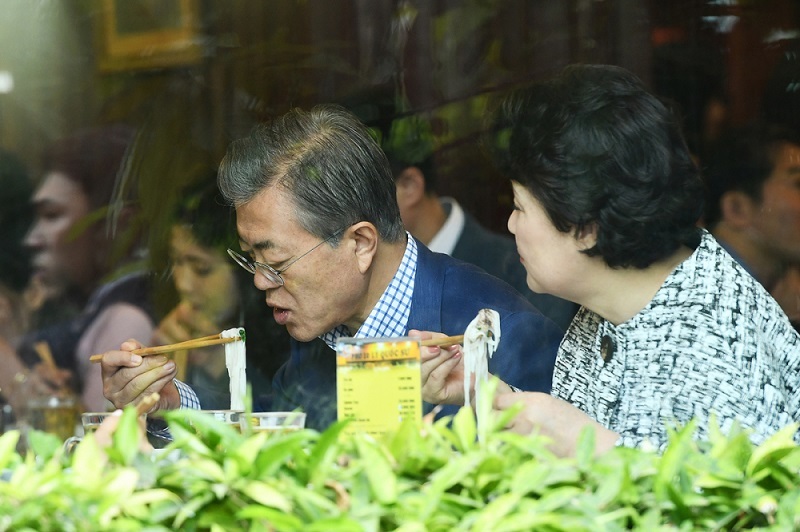 President Moon Jae-in and his wife had breakfast at a local pho noodle soup restaurant during a state visit. President Moon Jae-in and his wife Kim Jung-sook, a classical vocalist, are accompanied by a security team as they visit a pho restaurant on Hoang Minh Giam Street, Cau Giay District at 9 a.m. on Saturday, his last day during an official three-day trip to Hanoi. Moon squeezes a lime slice into his bowl of pho, the way many Vietnamese eat their most famous noodle soup, which was ranked 20 in a list of world's best foods by more than 35,000 CNN readers last year. Moon and his wife have two special bowls with beef, each for VND150,000 ($6.60). Pho is considered a symbolic food of Vietnam and is available across the country, but many believe the best and most authentic is served in Hanoi. The restaurant was informed of Moon’s visit a week ago. The restaurant gifts Moon a box of chopsticks that it made exclusively for VIP customers. Moon takes photos with a group of South Korean people outside the restaurant. A woman said she never had a chance to see him in person in South Korea.